A wheelchair came on the dias, it was the biggest auditorium in Mumbai, and took the centre stage. We heard a mechanised voice speaking to us, it took few minutes to realise and adapt to it. There were no movements of the person in chair, no expressions just a flat machine voice. Never in my life I will forget this public speech, it was Stephen Hawkings in Mumbai 2001. I was fresh in college and having read about his book 2 yrs ago, was fascinated and thrilled to see a hero. 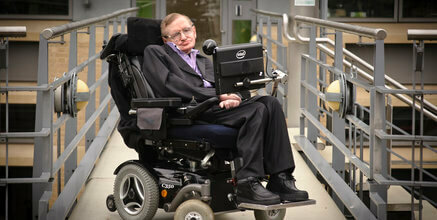 Being a science student with special interest in astrophysics those days Stephen Hawkings was God to me. I know how much of Juggad I had to do to get the passes, which was for one of the last row in the balcony. We have grown up reading about Edison, Einstein, Bose and Newton. But to see someone, in real, and listen to him, who’s theories have changed the world in contemporary times is a unique experience. The joy can’t be expressed in words. Today as I write this, I recall those few hours I was at the event. “A brief History of Time” is one of my earliest readings and remains my favourite. I have had recommended this book to many friends as I was fascinated to read some of his theories in the book. They changed my outlook to life, science and religion and largely towards God. He taught me to think beyond the 4th dimension. Twins paradox kept me thinking for months, and we friends debated over it for a long time. The book helped me link the sub atomic particles to the universe and beyond. Space, Time, Relativity were made simple for us college kids to debate while we had our meals in break. Last week I had gone to meet a friend, who has a leg amputated. While discussing about his life, future and general talks, he questioned that why should he marry a physically challenged girl, just because he has a leg amputated. He mentioned about Stephen Hawkings. Hawkings was an inspiration to him, my friend mentioned that if he could marry multiple times a normal person, why can’t he. The difference is to reach the peak of success in life. Stephen Hawkings was inspiration to him. Today I woke up to hear about his demise. I felt blessed that I had a chance to see, hear him. I am his student and my teacher has passed away in person but shall continue to live in books and theories for generations to come. A lot shall be written and said about him for next few days, that’s how our media works. But the sale of his books even after decades shall be a rightful tribute to him, when his work is challenged and criticized to improve global scientific theories and give birth to new scientists. In my readings later, when I read religion specially Buddhism in the book “Haunting the Buddha”, I could carefully relate a lot due to my earlier readings of Stephen Hawkings where the concepts of universe and sub atomic particles are explained in depth. Hawkings, like Buddha, discarded the reasons to comment on God, he made God “unnecessary”. A stand many scientist have not been able to take. I salute him on two grounds. One for his knowledge and science theories, and the other for overcoming his physical disability to lead a successful life. Stephen Hawkings was no less than an “Enlightened Man – A Buddha” in today’s world.